To score no goals away from home and come away with nothing is understandable. But to score three goals on the road and not get even a point is a bitter pill to swallow. One point from nine, after three league games in a week, has given Bradford City a reality check on their promotion hopes. But with another midweek match in the Johnstones Paint Trophy next week, there is no let up for a side that looked jaded as the busy fixture list appeared to catch up with them. There was only one change from the squad which drew at Rochdale on Tuesday with Zavon Hines coming in for the injured Kyel Reid. Parkinson kept with a 4-4-2 formation with City looking to capitalise against a Dagenham side languishing at the wrong end of the table with only one win this season. 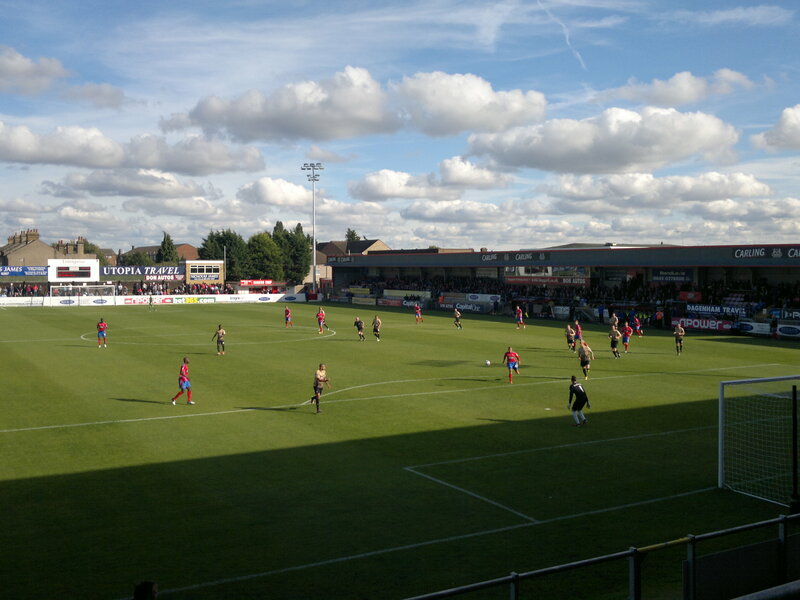 It was Dagenham, however, who got the killer blow with an early goal in the 6th minute. A break down the left hand side and it was Billy Bingham who slotted home from outside the area after Jon McLaughlin had parried an initial Dagenham effort. The goal seemed to deflate City and spur Dagenham on, who were first to every ball and attacked with confidence and assurance. City on the other hand, became wasteful in their passing and lacklustre in providing a response to the Dagenham threat. City’s first effort on target didn’t come until the 30th minute with a James Hanson header from Nahki Wells’ cross forcing a comfortable save from the keeper, but any hope of City mounting more pressure for an equaliser was short-lived as Medy Elito cut inside Davies and crossed the ball to Michael Spillane to covert Dagenham’s second. It became apparent that City were missing the control and drive of Gary Jones in midfield and the direct attacking threat of Reid, as Hines struggled to get involved. City were nearly three down at the break as an attack on the stroke of half time resulted in Bingham curling a shot just past McLaughlin’s post. The boos sounded from the City fans at half time and it was clear that a change was needed after a shambolic and lifeless first half display. Parkinson brought on Connell for Hines and resorted to a 4-3-1-2 formation, with Connell sitting just behind the front two of Hanson and Wells. The half time team talk appeared to do the trick with City coming out with more urgency and purpose and Hanson close to converting a Wells cross in City’s first chance of the half after 46 minutes. However, more slack defending and it was 3-0 and it appeared that City were well out of sight. No City defender tracked Luke Wilkinson who scored from a near post header on 53 minutes and it was on the verge of becoming embarrassing for a City side sitting in the playoffs with hopes of promotion. A quick response was needed and it came just two minutes later after Bingham fouled Wells on the edge of the box. Wells stepped up to curl the resulting free kick home from 25 yards. Things got even better on 61 minutes when City got a fortunate penalty after Connell collided with Dagenham keeper Chris Lewington in the box. Wells converted the spot kick and suddenly the belief of a remarkable comeback seemed on. Parkinson made an attacking change on 72 minutes with Garry Thompson coming on for Will Atkinson as City pressed for an equaliser, but against the run of play it was Dagenham who got a fourth. Dwight Gayle caught the Bantams on the counter attack with a run from just inside the City half outpacing the defence and slotting home to the left of McLaughlin. This didn’t continue to affect City though as the fans got behind them and sensed that goals were possible to come by after acquiring the first two within six minutes at the start of the second half. Nathan Doyle became City’s notable outstanding player as he grasped control of the midfield in the second half, with City pressing to get back into the game. City came close in the 79th minute with Dagenham clearing an Davies header off the line from Doyle’s cross and were rewarded with a 3rd goal in the 84th minute with Connell heading come from a Doyle throw after a scramble in the Dagenham box. Five minutes of injury time added to the belief that City could grab an unlikely equaliser and send the travelling fans home happy, but it was not to be with Davies agonisingly directing a header just over the bar in the final minute. The players deserved their praise from the fans for a spirited second half performance, arguably the best 45 minutes by a City team for a long time, but the damage was done with a dire first half performance and it became too much to ask after going down 3-0 early in the second half. A welcome break from the frequent mid week fixtures along with the tightening up of the City defence should help to ensure the promotion campaign gets back on track with the visit of York to Valley Parade next week. City: McLaughlin, McArdle, Oliver, Davies, Meredith, Atkinson (Thompson 72), Ravenhill, Doyle, Hines (Connell 45), Hanson, Wells. I decided to go to this game at the last minute and after 30 minutes wished that I hadn’t. Having watched this team develop through preseason, the Ireland tour and a good few of the league games, it was the first time I’ve felt really disappointed with the team’s attitude. Half the team appeared to want to coast it while the other half seemed like they’d decided that not having two key players in the side was a good excuse not to compete. In other words they were not mentally strong enough. I sincerely hope that the players don’t hide behind the second half ‘recovery’ and each of them reflects on their individual approach to the game. If they aspire to play in a higher league -and to a man they have the skill to do so- then they’re going to have to get a winners mentality. On a more positive note the 4-3-1-2 with Connell playing a Beardsleyesque role looked very effective and may yet prove to be an answer to the problem of missing Reid and playing two midfielders that tend to sit deep particularly as Zavron doesn’t look ready yet to take the role of the major wing attack. A good article, which I enjoyed reading, but aren’t we away at Hartlepool in the JP Trophy on Tuesday? sorry i meant when we get a welcome break from fixtures it will help us. Didn’t mean next week!